Our parent and family programs build on the existing strengths of families so they become even stronger. The Strengthening Families Program for parents and youth is delivered over seven or fourteen weeks in parent, youth, and family sessions that are highly interactive and include role-playing, discussions, learning games, and family projects. 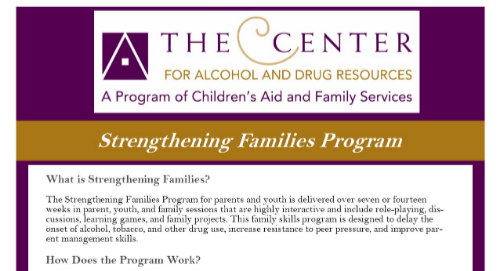 This family skills program is designed to delay the onset of alcohol, tobacco, and other drug use, increase resistance to peer pressure, and improve parent management skills. Families are provided with dinner, free babysitting, transportation (if needed), and a $100 Visa Gift Card upon graduation. Click image below for downloadable flyer. 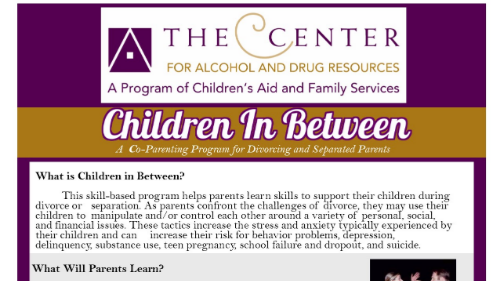 This skill-based program helps parents learn skills to support their children during divorce or separation. As parents confront the challenges of divorce, they may use their children to manipulate and/or control each other around a variety of personal, social, and financial issues. These tactics increase the stress and anxiety typically experienced by their children and can increase their risk for behavior problems, depression, delinquency, substance use, teen pregnancy, school failure and dropout, and suicide. For more information on these programs contact Chanel Dupree at 201-740-7096 or cdupree@cafsnj.org. 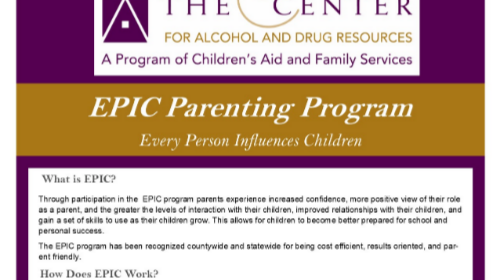 Through participation in the EPIC program parents experience increased confidence, more positive view of their role as a parent, and the greater the levels of interaction with their children, improved relationships with their children, and gain a set of skills to use as their children grow. This allows for children to become better prepared for school and personal success. The EPIC program has been recognized countywide and statewide for being cost efficient, results oriented, and parent friendly. For more information on this program contact Lannie Jaconia at 201-740-7110 or at Ljaconia@cafsnj.org.